The Youngstown State volleyball team notched 12 blocks, and three Penguins had at least nine kills in a sweep of Milwaukee on Friday evening at Beeghly Center. The set scores were 25-16, 32-30, 25-17. Lori Vanbeek had 10 kills in 20 attempts and added three blocks, and Lauren Thompson was also efficient with nine kills in 17 swings. She tied for match-high honors with five blocks, and Nikki Thompson was the top defender with 19 digs. Val Jeffery ran the offense well with 40 assists. The 12 blocks were the second-most for the Penguins this season, and they helped the Penguins hold Milwaukee to a negative attack percentage in two of the three sets. "I thought our team played extremely hard and with a lot of energy tonight," YSU head coach Mark Hardaway said. "We took advantage of all the opportunities Milwaukee gave us. We put a lot of pressure on them, and our team followed our game plan to the letter tonight." Kaisa Mattson had a match-best 11 kills, and Maddie Williams had nine kills for the Panthers, who beat Horizon League preseason favorite Oakland on Thursday. No other UWM player had more than four kills, and setter Kayla Price was the only Panther to have an attack percentage higher than .200. Sarah Varcolla had back-to-back solo blocks early in the first set as YSU scored 11 of the first 14 points of the match. The Penguins had more blocks than the Panthers had kills when the score was 16-6, and YSU held UWM to a minus-.056 attack percentage in the set. There were 11 ties and four lead changes in the second set, and both teams fought off set points before YSU finally won at 32-30. Vanbeek and Lauren Thompson combined for 11 kills in 17 attempts without committing an error in the set. Youngstown State led 23-19 following an ace by Nikki Thompson, but Milwaukee scored the next four points to tie the set at 23-23. Aly Ryan's kill gave YSU a sideout, but UWM scored the next two points to set up its first of three set point chances. 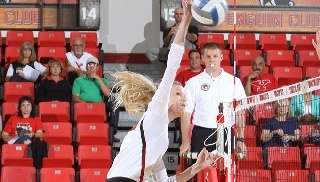 Vanbeek had kills to give YSU three set points, and an error by Mattson gave YSU a 31-30 advantage. Ryan and Jessie Gerig, who was playing in the front row because the Penguins ran out of subs, combined to block Sammi Herron to finally end the set. YSU scored four straight points to go up 8-4 in the third set, and it did not trail again. Milwaukee got within one at 12-11, but Youngstown State went on a 6-1 run to pull ahead 18-12. The closest UWM got was 18-14. Youngstown State will conclude its three-match home-stand on Tuesday when it hosts Robert Morris at 7 p.m.